Screen grab from the making of 'Hardwired' clip on the Met site. Must say it put a nice smile on my dial to see the VH4, (and the Crunch Berries) right there in the control room pumping out James' tones, rather than a modelling rig. Surprised to see the Jackson V getting some love again. Anyone ID the amp head on top ? I can't pick it straight away. Top is the same ole' Wizard Modern Classic (first edition) he's had since late '96 or so that started being prominently featured on Reload and Garage Inc and so forth. If it does not play drums, it does not help. I wonder how the Wizard stacks up to a vh4 tone wise? A little more vintagey, maybe? They're nothing alike - nothing. Not to mention that Wizard is a really old and original single input model. It's low gain by today's standards. I'm happy to say I have all three of those amps. 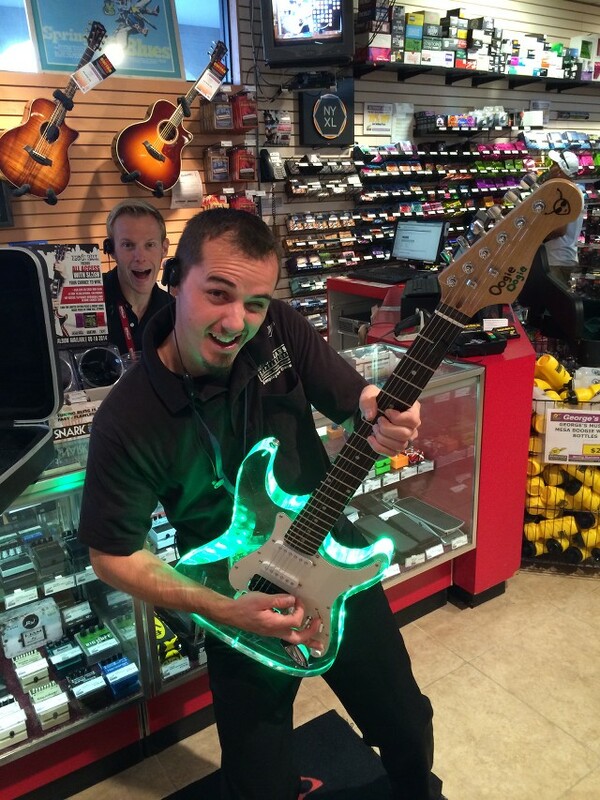 Everyone NEEDS at least 1 glow in the dark guitar!! Well, after finally scoring myself an MCII and playing it mixed with a VH4, (and actually finally hearing a Wizard in person), it was a revelation to me to hear how much the Wizard tone is on the HWSD album [IMHO], and I'm sure and big part of many Hetfield recordings since Load days. I hooked them up and got a nice blended tone, then started playing some of the HWSD riffs when it really hit me. Just using a regular '58 RI Les Paul, no high output pickups. Seems like the Crunch, tightness and clarity part of his tone feels to me mainly to be the Wizard, the bottom and deep low end feels more like the VH4 doing that portion. I'm sure the IIC+ is in the mix too. The MCII and the IIC+ don't actually feel worlds apart to me, maybe its just the way I set my amps by habit and my ears. Funny thing is that Hetfield uses an Axe-Fx rig live. His tech had the job of replicating its VH4 tone on the Axe to be spot on. I saw a video explaining the whole thing not long ago. It doesn't sound the same live. I'll take the real deal anytime. Excellent transactions with: sjk (S: Soldano SLO 100), glip22 (S: Gibson Historic LP R7), MrPlexi (S: Suhr PT100), Metalhead (S: PRS SC-250 AP), killertone (S: Diezel Herbert), tlingen (S: Engl SE EL34), fuzzyguitars (S: PRS Tremonti Trem & Gibson Historic LP R8), xzyryabx (S: Engl Savage 120), Devilinside (S: Randall Satan), DarkCide: (S: ESP M-II), Mizati20 (S: PV 6505+), bartmcartman (S: Bogner XTC 101B), thaifoo (S: Engl Savage 120), lester (S: Bogner UberKab 4X12), adrenalinejunky (S: Fryette UltraLead), gbsmusic (S: Fender EVH Wolfgang), savant421 (S: Bogner UberKab 4X12 cab), ams2ek (S: Mills Acoustics 4X12 cab), blastcap (S: Gibson Explorer), braciola (S: PV EVH Wolfgang USA), splawner (S: Wampler Plextortion), mhenson42 (S: Celestion V30 speakers), Gsxrbusa (S: Jackson SL2H), El Mariachi (S: Suhr Koko Boost), braintheory (S: Engl SE EL34), ChurchHill (S: Gibson Historic Custom BBR7), RKnight (S: Mesa Mark IV), and many more.